In my last post, I mentioned that one of the most striking features of the Gulf Coast aquaculture industry was its energy. It’s the enthusiasm and optimism that pervades my interviews. Last month, I was able to attend the third annual Oyster South symposium, which might be where this industry positivity gets its power from. As I suggested in an earlier post, if it’s not the source of the energy, Oyster South is at least a catalyst for it. In their own words, Oyster South “is a 501(c)(3) non-profit dedicated to the advancement of oyster aquaculture in the southern United States.” They are a community of oyster farmers, restaurateurs, dealers, seed and gear suppliers, writers, educators, and researchers, whose mission is “to cultivate a South that encourages and includes successful farms, healthy waters and the birth of new traditions.” And, in this grad student’s opinion, they’re pretty awesome. Oyster South is a community in support of the southern farmed oyster, and you can support them by getting some of their awesome merch! Photo by Mississippi-Alabama Sea Grant. I was excited to be in Alabama at the same time as the symposium. I’d been following the activities of Oyster South for the past year or two, but this would be the first event I attended. I can only describe, as the anthropologist and constant observer, that the meeting wasn’t your typical meeting. Sure, it included scientific presentations, three-minute tech talks, and informative panels. It covered the bases and provided useful information for industry members from a diversity of sources. The meeting environment, however, was almost like a family reunion, and I think many of the attendees would agree. As folks entered, many hugged and greeted each other, ready to catch up on what they’ve missed. And for the newbies, like myself, we were welcomed right into the family. 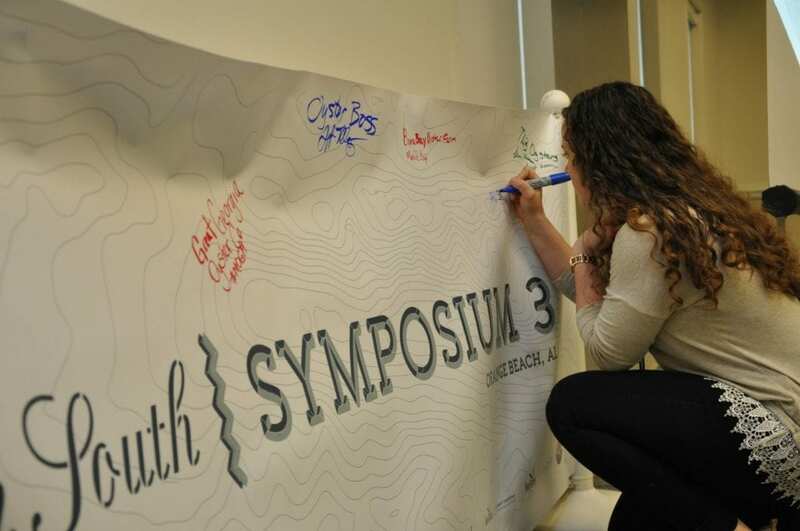 The “guest book” for the Oyster South Symposium was the meeting banner, where attendees signed their names and left messages for the group. 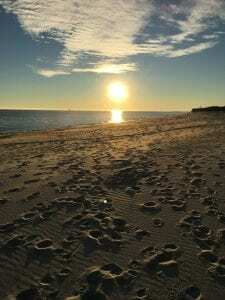 Photo by Mississippi-Alabama Sea Grant. While I’ve thus far been painting a fabulous picture of southern oyster aquaculture, everything isn’t sunshine and rainbows for southern oyster farmers – though they get a lot of those, too. It’s not all perfect. It’s not easy. It’s not a fast money-maker. At the symposium, farmers shared their tales of last year’s hurricane season. Some farmers lost everything, and it wasn’t for lack of preparation. In the weeks following the storms, sedimentation and water quality took oysters that survived the wind and surge, but couldn’t tolerate the subpar water. Growers suffered closures and had to wait to sell the oysters that did make it. Still, even with, in some cases, catastrophic losses, southern oyster farmers threw on their boots and started over. Oyster South provides the opportunity for farmers to share these stories, providing a real understanding of expectations for new farmers, and a way to brainstorm and discuss solutions and best practices. 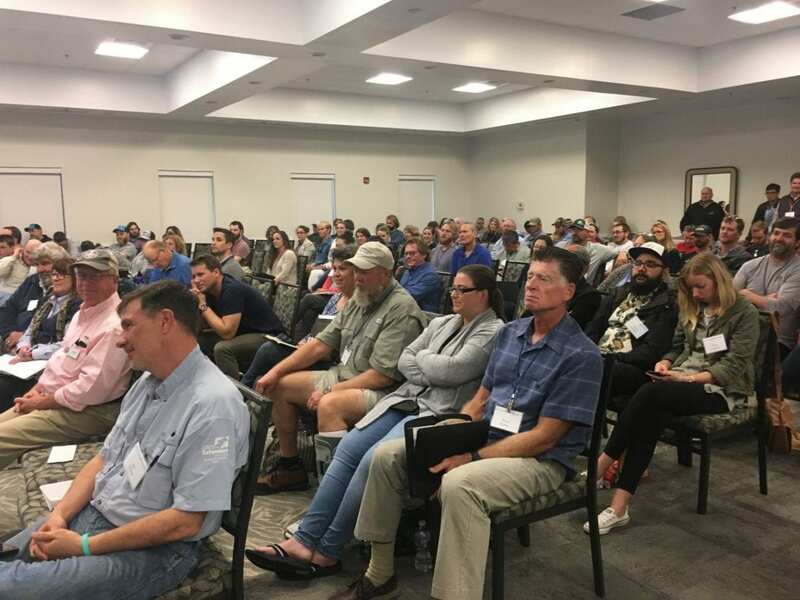 The third Oyster South Symposium offered participants the opportunity to tour local farms and hatcheries, listen to a variety of panels, scientific, and tech talks, check out a trade show, and meet others who share the same interest in the southern oyster. Photo by Mississippi-Alabama Sea Grant. The Symposium allows for the exchange of information and experience among oyster farmers, the restaurateurs buying and serving their oysters, researchers investigating a range of issues related to oyster aquaculture, writers focused on the rise of the southern oyster and oyster aquaculture in general, and much more. And during the breaks, the receptions, and the down-time, attendees extend their networks, making connections, and probably even making a few friends, all centered upon this small bivalve that brings them together. It’s an exciting time for oysters in the south, and I’m glad I’m able to be part of this network, even if on the periphery. The last feature of my “quick take on the differences between farming oysters in the Chesapeake and the Gulf of Mexico,” is the initial inspiration of this series. 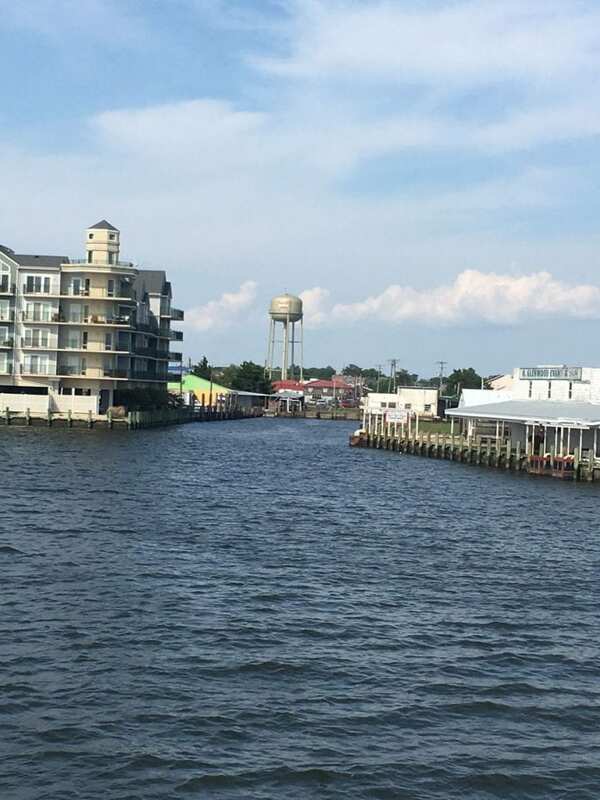 As you’ve already read if you’ve been following along, there are a number of general differences in aquaculture practices and trends between the Chesapeake and Gulf Coast industries. There’s another difference, however, that was most striking to me when I first arrived in Alabama and it continues to be present in my interviews, interactions, and observations. That difference is the energy. 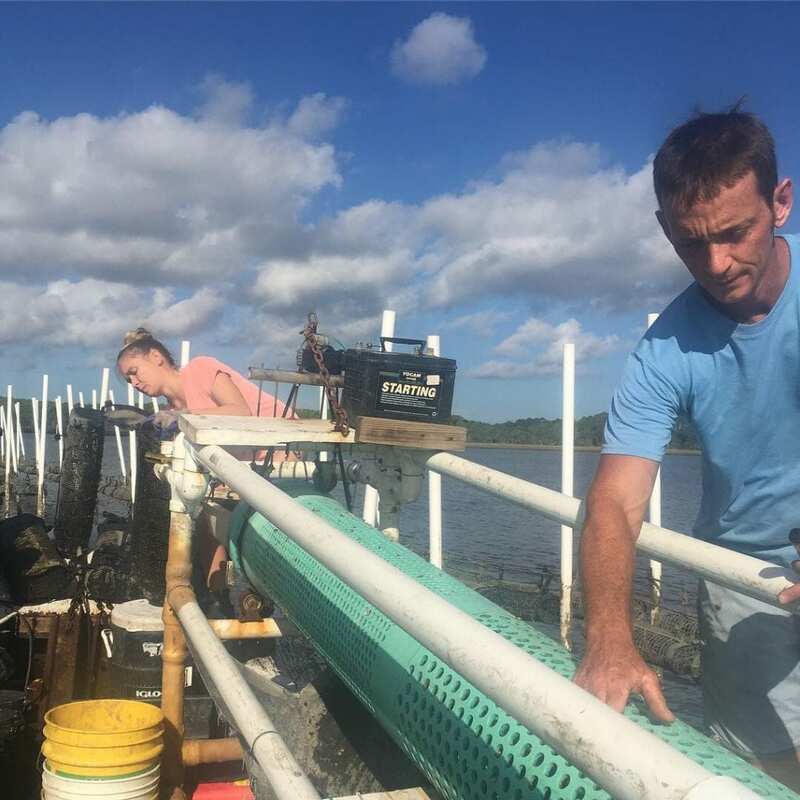 During a visit to Bama Bay Oyster Farm, I met Dr. Amy Sprinkle, who’s helping to get her University of South Alabama students excited about aquaculture through hands-on training that complements coursework. Photo by A. Michaelis. It’s perhaps fitting that, as my research aims to detail the non-tangible, hard to describe, cultural ecosystem services provided through oysters, the difference that I find most interesting and most noteworthy is something also challenging to put into words. The energy within the oyster aquaculture industry down here, however, is palpable. And positive. Maybe it’s because for many Gulf states, oyster aquaculture is a relatively new industry. Or at least new in the current approach to growing oysters. Maybe if I return in 10 years and replicate my interviews, I won’t find that same electricity and enthusiasm. I hope that’s not the case. At the moment though, there’s a forward-looking optimism as participants discuss their farms and where they’d like to take them. 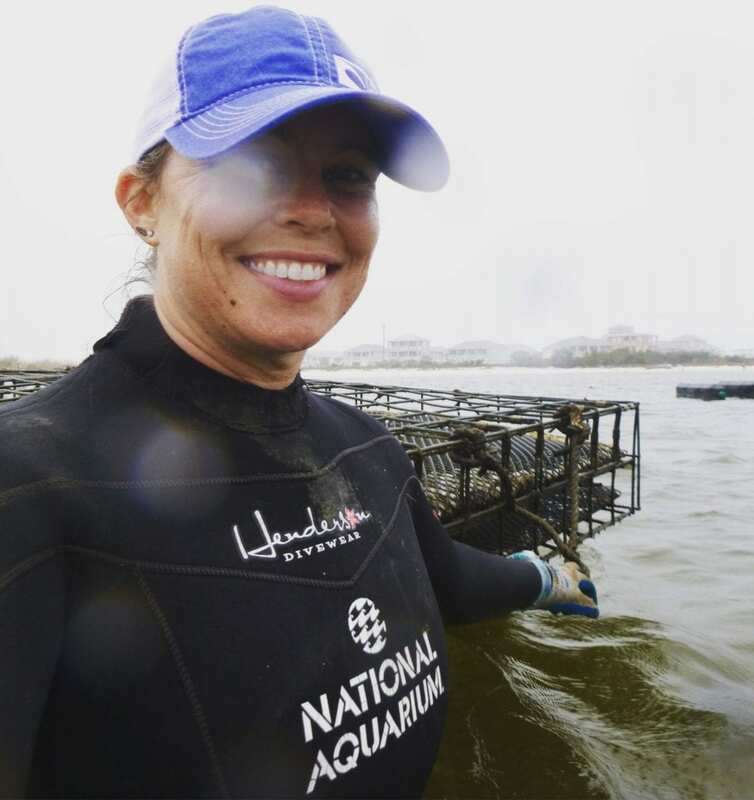 And it’s not just enthusiasm about their individual farm, but about the state, the Gulf, the South, and even the whole oyster aquaculture industry. It’s exciting. Growers here are part of a rejuvenation of sorts for Gulf Coast oysters. As the wild harvest has been plagued by hurricanes, oil spills, freshwater input, and runoff, the rising oyster aquaculture industry could help revive working waterfronts (though farmed oysters also must face these obstacles). These farmed oysters aren’t necessarily going to replace the wild harvest industry and re-open shucking houses that have closed over the years, because they typically target a different market – the half shell market. But, they’re helping to infuse new incomes and livelihoods into areas that need them, while at the same time promoting Gulf oysters in general, which helps both the wild and farmed industries. Murder Point Oysters (whose farm is shown here) represents one group helping to inspire that energy and pride in southern farmed oysters. Photo by A. Michaelis. It’s important to emphasize that this energy observation doesn’t mean that everyone in the Chesapeake is doom-and-gloom or hanging their heads a la Eeyore when they talk about their industry. I’ve met many Chesapeake growers equally excited about their enterprise and passionate about their work. Perhaps it’s an effect of the length of time in the industry (something I’m looking at in my research), but more of the barriers and impediments are on the minds of Chesapeake growers and that comes up in my interviews. The first project in Maryland also involved questions that targeted challenges, so that opened the door to discuss the less sunny side of business. And finally, this difference in perceived energy could also be an outcome of my own time in Maryland. I worked with and interviewed Maryland oyster growers for over two years, compared to my two months in the Gulf. This enhanced familiarity may have led to a greater willingness to share what ails you, in one sense or another. So, don’t worry my Chesapeake farmers and watermen, I haven’t forgotten your enthusiasm and love for your work – from dance parties while pulling cages, to sidebar stories that went well off the rails, there’s positive energy there too! The fourth distinction in my “quick take on the differences between farming oysters in the Chesapeake and the Gulf of Mexico,” is the length of the grow-out process for oysters. The grow-out process is faster down south. Warmer, generally saltier waters make for a longer period of growth throughout the year and faster oyster growth. This means a farmer can make money off of their oysters sooner (roughly a year earlier depending on the site and type of oyster they’re growing). That could have major impacts on how soon before a business starts making a profit. Using his hot off the press dissertation work, Matt Parker (UM Extension) compared how the differences in grow-out might affect profitability at the recent Oyster South Symposium. Matt’s model indicates that, based on variable grow-out rates, southern farms may reach profitability sooner than farms in the Chesapeake Bay. Lane Zirlott of Murder Point Oysters in Alabama shucked some oysters for me that hit the water well under a year before we enjoyed them. Faster growth = oysters that can be sold sooner. Photo by A. Michaelis. Faster growing oysters also mean that if an oyster farm suffers a loss, they can potentially recover from that loss more quickly. Some industry experts suggest that an individual farm should expect one catastrophic loss every 10 years. Such losses could be due to major storm events, an epidemic of oyster disease like dermo or msx (which would also likely be linked to rainfall and its impact on salinity), or even individually-specific personal situations that may prevent them from working their oysters as much as they should. Every benefit has its costs, and one of the costs of faster growout relates to labor and handling. Growers in the south need to be more aware of their stocking density – how many oysters they put in a basket or cage. Left untended, or not tended frequently enough, oysters can grow so fast that they crowd one another to the point of death. This means that southern oyster farmers need to plan for more frequent handling and separating of oysters, or be prepared to stock at low enough densities that the oysters have plenty of room to grow. Low density stocking, however, equals more gear and more space to spread that gear. Oyster farmers must do their own cost-benefit analysis when it comes to gear costs, labor, and oyster handling. In addition to faster oyster growth, southern growers also experience more biofouling of gear. 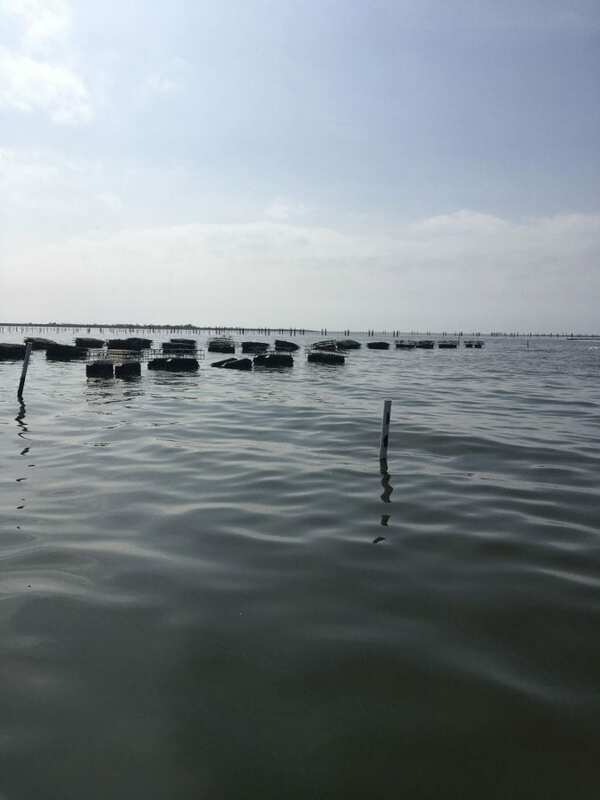 To combat this, growers often utilize gear like the OysterGro floating cages seen here — growers can flip the cages for short periods of time to desiccate and reduce biofouling. Photo by A. Michaelis. 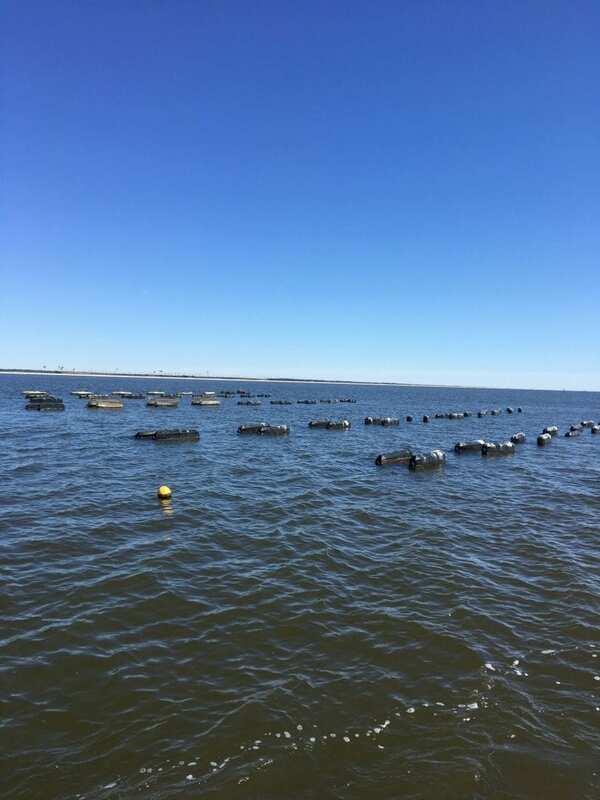 For the third installment of my “quick take on the differences between farming oysters in the Chesapeake and the Gulf of Mexico,” I’ll highlight participation in aquaculture by commercial fishermen. Important to my own research questions, there seems to be less overlap down south in terms of commercial fishermen participation in aquaculture. In other words, there are more watermen growing oysters in the Chesapeake than there are tongers growing oysters in the Gulf. At this point I can’t say if this is a *statistically significant* trend. There are certainly more watermen growing oysters in the Chesapeake in terms of overall numbers, but thinking about it as a percentage of the industry, the numbers may not be so different between the two regions. There are more growers/farmers overall in the Chesapeake so it’s not surprising that there are more watermen growing oysters within that larger group. 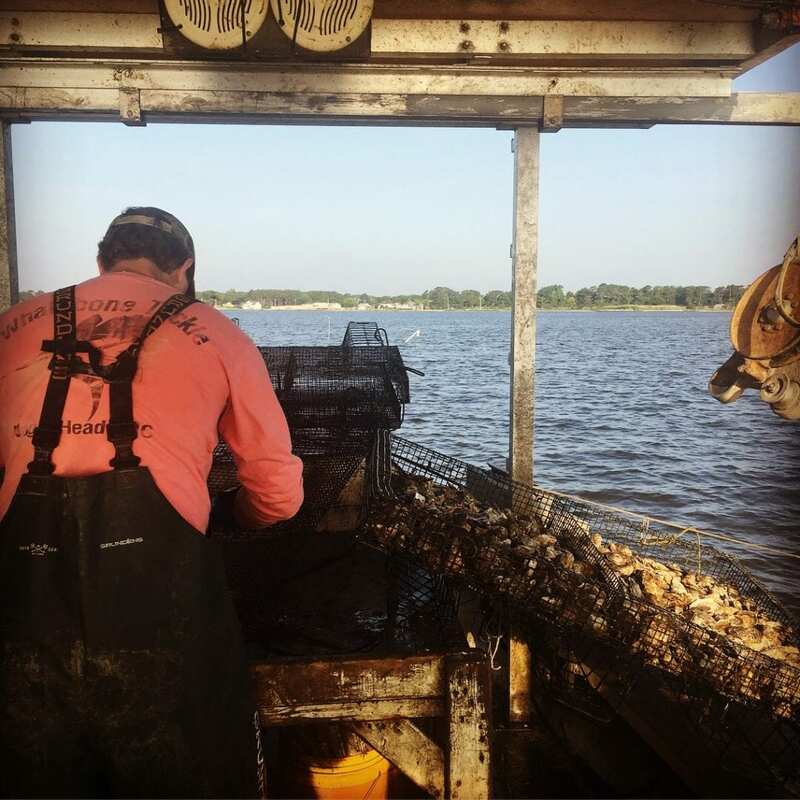 In addition, given the current status of each region’s wild oyster fisheries, there are likely more wild oyster harvesters in the Chesapeake than in the portion of the Gulf that I’ve visited – a visit to Louisiana might change that trend. 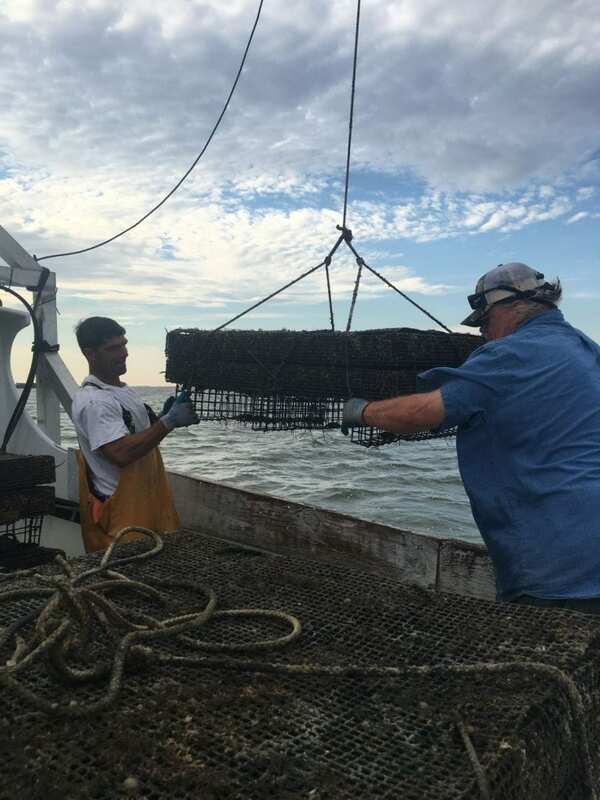 On-bottom culture in the Chesapeake also, both in the past and present, fits in easily with traditional wild harvest work and has existed historically as watermen moved oysters to private “seed beds” to grow out. I’ve also interviewed fishermen involved in fisheries other than oysters who have gotten started in oyster aquaculture. Ben Mumford of Mumford Shellfish worked as an offshore fishermen before returning to Maryland to start his own oyster farm. Photo by A. Michaelis. Why is this particular observation important to me? One aim of this project is to see how suitable oyster aquaculture is as an alternate livelihood for wild-harvest or wild-catch commercial fishermen. Does it provide the same sort of well-being and job satisfaction that people get from working in a wild fishery? As my research will likely show, a person’s livelihood choice is about more than just the money, and if commercial fishermen are expected to transition into oyster aquaculture (as is promoted in certain areas), then it’s important that they enjoy the work just as much. This isn’t to say that all commercial fishermen should switch to oyster aquaculture, or that oyster aquaculture should be an industry occupied only by former wild harvesters. One of the good things about farming oysters is that it enables individuals who aren’t part of a family legacy of working the water to take part in an on-the-water trade. It’s not always easy for a person not connected to a wild catch fishery to enter one, but aquaculture provides opportunity in that sense. On the other side of that, it also provides opportunity for families who do have that legacy on the water to continue working the water in areas where a public or wild fishery no longer provides a consistent household income. Approved aquaculture parks reduce some (maybe not all) of the headaches of the application and permitting process, and consolidate lease area in locations that are less likely to receive protests while allowing for the cultivation of a good oyster. There was a similar idea in Maryland, with the creation of Aquaculture Enterprise Zones, but to my knowledge not much was pursued in the use of these zones and, if my interpretation of code is correct, they no longer exist. There’s a very important difference with the Gulf Coast oyster aquaculture parks that isn’t present in the discussion of Maryland’s Aquaculture Enterprise Zones. 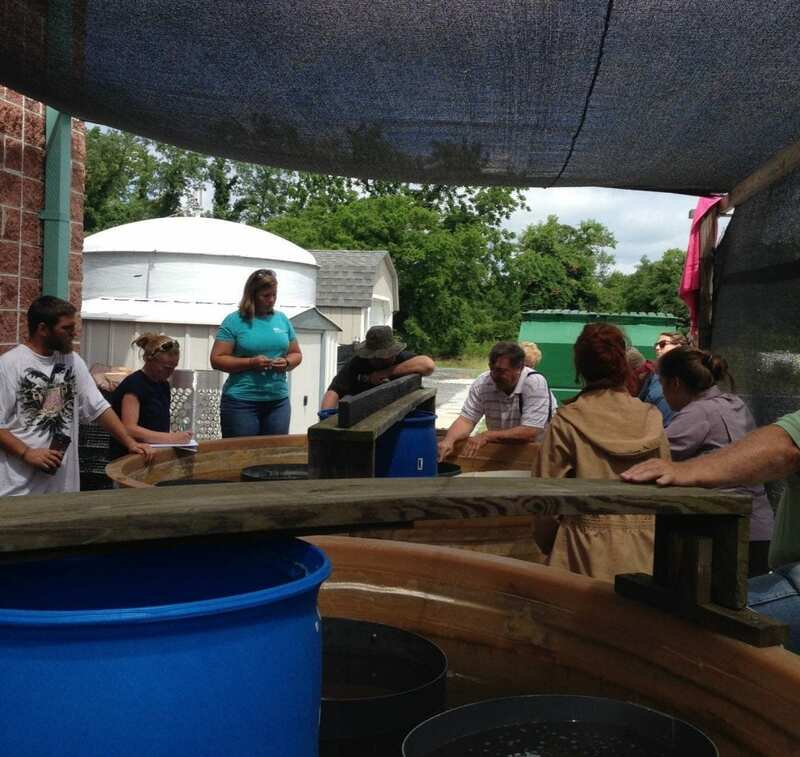 Another feature of the parks that I’ve visited in three Gulf states (AL, MS, and FL) is that entities like the Auburn University Shellfish Lab with Mississippi-Alabama Sea Grant, Mississippi Division of Marine Resources, and the Wakulla Environmental Institute incorporate training opportunities that folks can apply to participate in before diving into their own new business. Trainees benefit from hands-on practice and courses. This allows would-be oyster farmers to test the waters so to speak, and ensure that not only is farming oysters something they’d like to do, but also that they’re prepared to do. 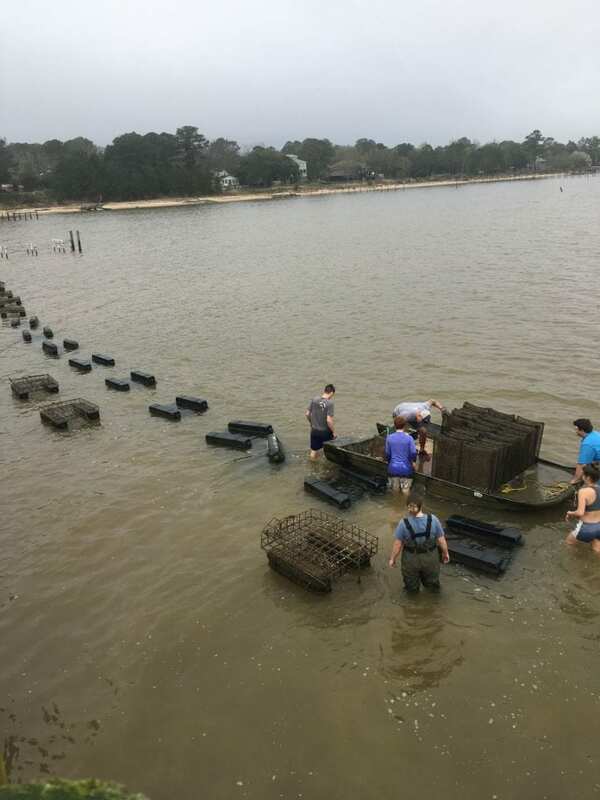 Participants aren’t obligated to start an oyster farm upon completion of training, but the majority do and credit the program as being critical to their ability to begin their new business. As I mentioned earlier, there is one similar program that I know of in Maryland. The Phillip’s Wharf Environmental Center (PWEC) began a training program while I was still conducting fieldwork in Maryland. The PWEC Aquaculture Training Program aims to involve young people in working waterfront communities to: enhance their existing wild harvest business, begin their own aquaculture operation, or develop skills to work in existing aquaculture operations. The course is hands-on and introduces students to “what you need to know to grow”: lease siting, lease application process, nursery skills, farm setup, boat selection and handling, etc. After completing the course, students have the option to work in the PWEC incubator, which provides an area of the PWEC lease to work, equipment, seed, and mentoring from setup through harvest. PWEC aims to build a certified apprenticeship program from this incubator to enable apprentices to work with seasoned growers while progressing toward their own lease. As part of my “quick take on the differences between farming oysters in the Chesapeake and the Gulf of Mexico,” I’ll start with a discussion of differences in gear prevalence. Floating gear, which keeps oysters near the surface in containers and typically involves a way to lift oysters out of water for period of time, is more common in the Gulf than in the Chesapeake, particularly the Maryland portion of the Chesapeake. My initial take on this is that it’s more difficult to get floating gear permitted in the Chesapeake than bottom cages or an on-bottom lease. Bottom cages are cages that, not surprisingly, sit on the bottom (usually elevated less than 12” with mesh “legs”) and in the Chesapeake are typically always submerged, until growers pull them out. 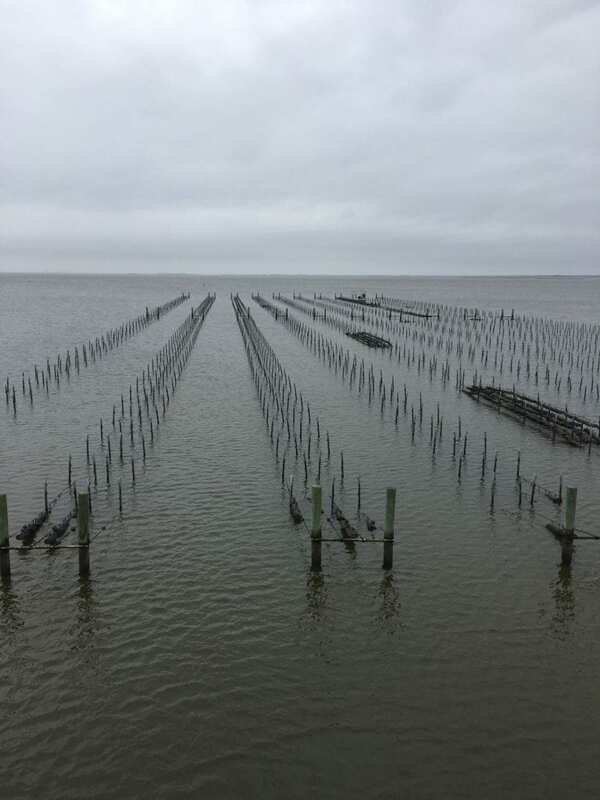 On-bottom aquaculture also occurs in the Chesapeake on submerged land leases where oysters are placed directly on the bay/river/sea floor, with no containers, and are harvested using the same gear as a wild harvester. For example, in Maryland, oyster growers can choose to dredge, patent-tong, hand-tong, or even dive their submerged land leases. The difficulty in permitting surface gear, based on most of my interviews, often relates to protests by neighbors who don’t want to see surface-floating gear (and sometimes people still protest about submerged gear and the floats that mark the end of lines or leases). Some of these issues may have been avoided in Gulf states thus far because of the nature of their aquaculture lease sites (more on that in the next post). Different degrees of coastal development between areas with aquaculture in each region likely influence the number of landowner protests. This ties to an important issue (in my opinion): as working waterfront communities are converted into waterfront condos and megahomes, protests may become more likely. This problem isn’t exclusive to aquaculture; wild harvest fisheries are also affected by the replacement of working waterfronts. In Alabama, aquaculture has for the most part found a home within and near historic working waterfront areas that have not yet been infiltrated by major development or neighbors opposed to seeing a working farm. 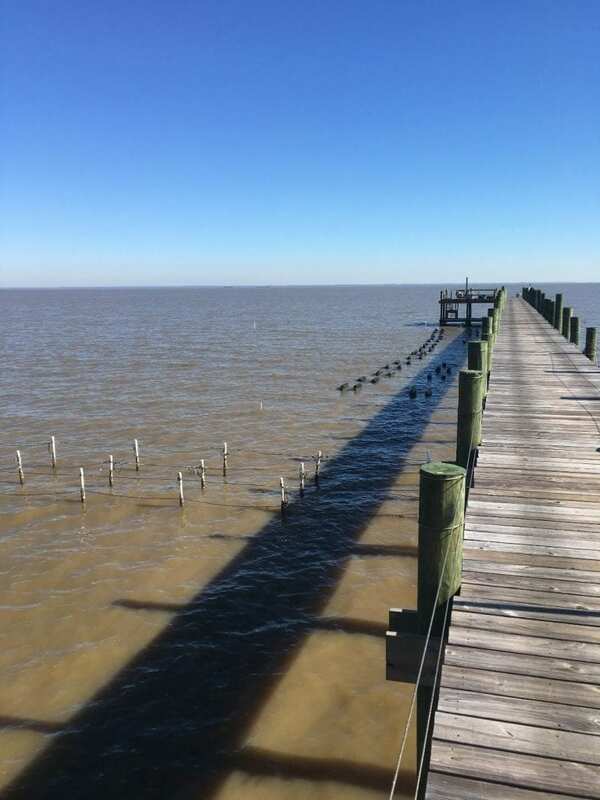 This is also the case on the eastern shore of Virginia, where a history of clam aquaculture may have paved the way for today’s oyster farms from a social opinion standpoint, but it is not the same situation throughout the Chesapeake. Aside from how the permitting and protest process influences gear choice, floating gear may produce a slightly different kind of oyster in terms of meatiness, texture, and shape and this is something that factors into decision-making when it comes to gear. In addition, each site is unique and gear must be selected with multiple factors in mind: access, wave action, nutrient availability, sedimentation, physical ability, cost…the list goes on. It’s hard to believe, but my time in Alabama has come to an end. Part of the reason the past two months seemed to go so fast is that I’ve been very fortunate to meet many people willing to take part in my project. An anthropologist’s dream. Spending so many hours with oyster farmers, commercial fishermen, other industry members, scientists, and regulators, in not only Alabama but also neighboring Mississippi and Florida, has helped provide a wonderful glimpse into the growing Gulf Coast farmed oyster industry. My time in Alabama went too fast, but allowed for lots of in and on the water experience with Alabama’s oyster growers. This photo was taken on a rainy day with Navy Cove Oysters. Photo by A. Michaelis. While down south I’ve been asked by a number of people what are some of the differences I’ve noticed between Gulf Coast oyster aquaculture and the Chesapeake, aside from industry age and scale. In both regions, they’re growing the same oyster – Crassostrea virginica – but there are a few general (not absolute) differences I’ve noted in terms of the methods and process. This post initially began as a single story emphasizing one difference that was most on my mind, particularly after attending the Oyster South Symposium in February. As I wrote, however, it just kept going and it seemed best to present these ideas as a series. Over the next several days, I’ll provide my snapshot of some of the differences between Chesapeake and Gulf Coast oyster aquaculture industries, based on my time in Maryland, Virginia, Alabama, Mississippi, and the Florida panhandle. It won’t be exhaustive, I’ll save that for the dissertation, but will focus on differences in: 1) gear choice, 2) the presence of aquaculture parks or zones, 3) participation by wild-catch/wild-harvest fishermen, 4) the grow-out process, and 5) energy. (These will all be broad observations; no stats, no analyses. I’ll get into more detail based on my data when I’m ready to write up the dissertation.) It’s this last difference (#5) that inspired the post, and I’ll wrap the series up with a final piece on Oyster South, which, if not the source of the energy, certainly catalyzes it. For better or worse, farming oysters, like any fishery, is heavily influenced by “Mother Nature”. She makes an appearance in nearly all of my interviews, and is a feature player in the paper I’m currently working on. Despite best efforts, oyster farmers cannot dictate what Mother Nature will do, and are forced to respond and adapt, time and time again. I’ve been in Alabama for two weeks now and oyster farmers here are waiting out Mother Nature so they can get back to harvesting oysters. Prior to my arrival, Alabama experienced one of its rainiest Decembers to date. The rain affected the region in a number of ways. It created a muddy campsite for me, but for oyster farmers it closed much of the Alabama coastline to harvest. All of the water has to go somewhere, and eventually it finds its way to the sea, passing through shellfish areas as it does. Six out of seven of the state’s shellfish growing areas have been closed since December 30, 2018. I learned of Alabama’s December rain upon arrival. For me, the impacts were non-consequential once a neighboring camper helped pull my trailer the few extra feet I needed. Alabama oyster farmers, however, are still feeling the effects as they wait for water conditions to improve. Photo by: A. Michaelis. Shellfish closures exist to mitigate risk to public health, because heavy rainfall means runoff from adjacent land. (Another reason to think twice about what you put on your lawn, dump outside, or don’t pick up, etc.) As a safeguard, oysters cannot be harvested and sold until the impacts of heavy rain have dissipated. This isn’t exclusive to Alabama; every shellfish-producing state enforces similar regulations. Here in Alabama, many farmers are going on 3 weeks of closure. Periodic closures are not atypical, but represent one more business challenge that oyster farms must prepare for. Farmers must plan for sporadic closures and hope that their buyers and markets can also accommodate the unexpected. 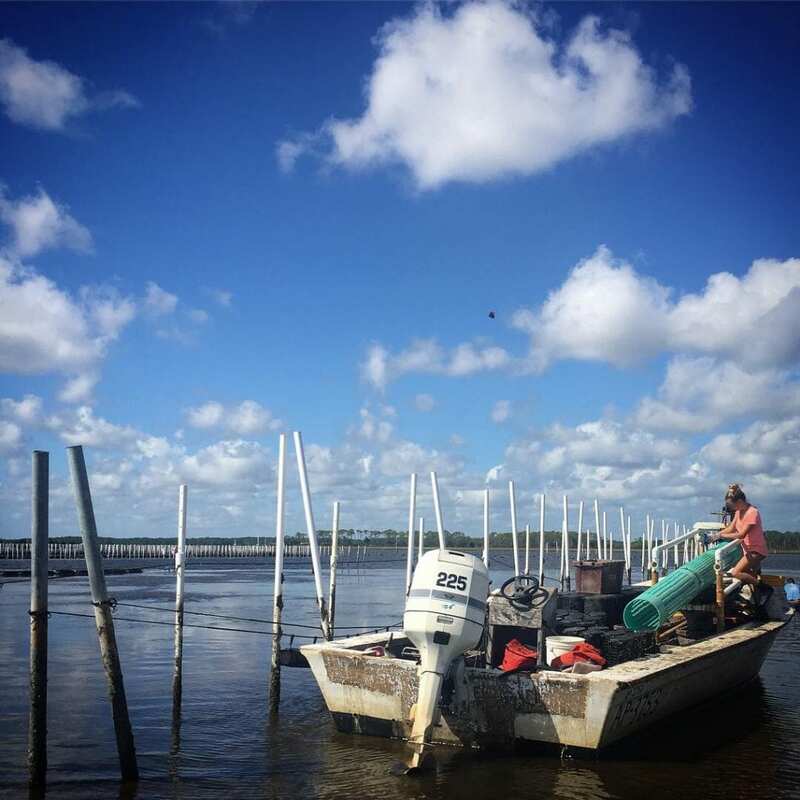 I had the chance to visit the Bama Bay Oyster Farm and chat with Dottie Lawley and Bette Kuhlman as they waited out the harvest closure and low salinity associated with the most recent rain events. It was the salinity that weighed heaviest on their minds, knowing the effect a prolonged freshwater period could have on their oysters. As such, they’ve been treating their oysters accordingly. Typical oyster handling could prove too stressful to oysters already strained due to low salinity. 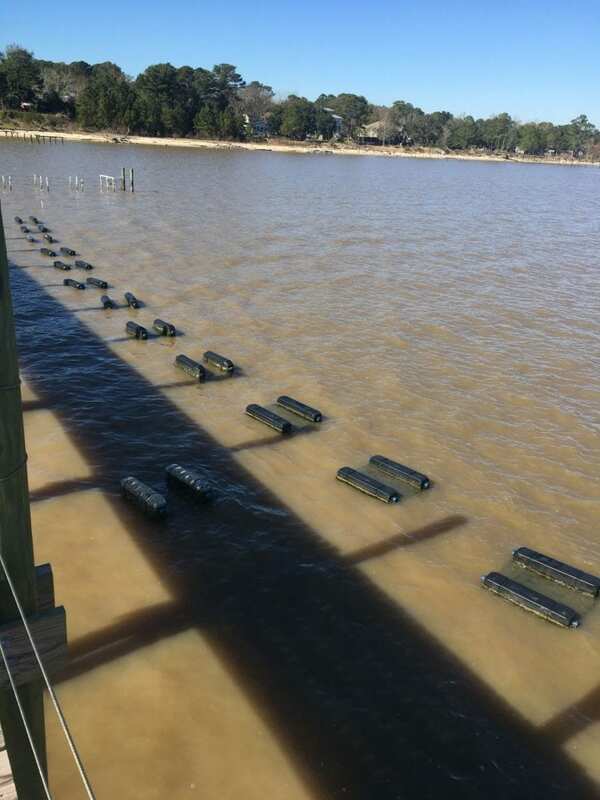 At Bama Bay, they are trying to minimize handling to help get their oysters through this sub-optimal salinity period. At the same time, they can only wait so long before the effects of not working the gear take hold. The sooner the salinity rises, the better. Oysters and farmers alike at Bama Bay Oyster Farm wait out the low salinity created by a December full of rain. The black floats that run parallel to the dock support the many oysters waiting in cages below. Photo by: A. Michaelis. Battling rainfall and all that it brings is par for the course for oyster farmers. 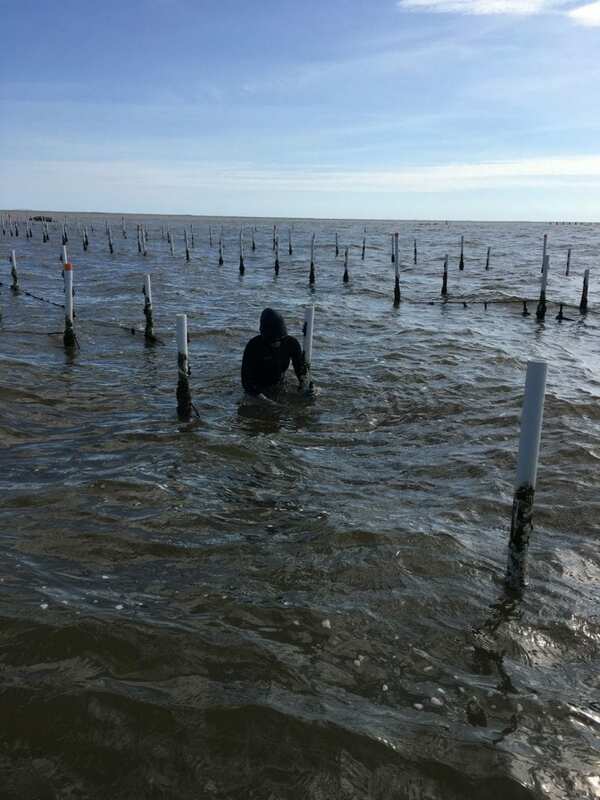 In most cases, it involves many lessons learned, but over time successful farmers learn to read the oysters as well as the water, and do their best to prepare for the unexpected. Okay, technically it’s the same oyster species, Crassostrea virginica, but as 2019 rolled in, the dogs and I loaded up and headed south. 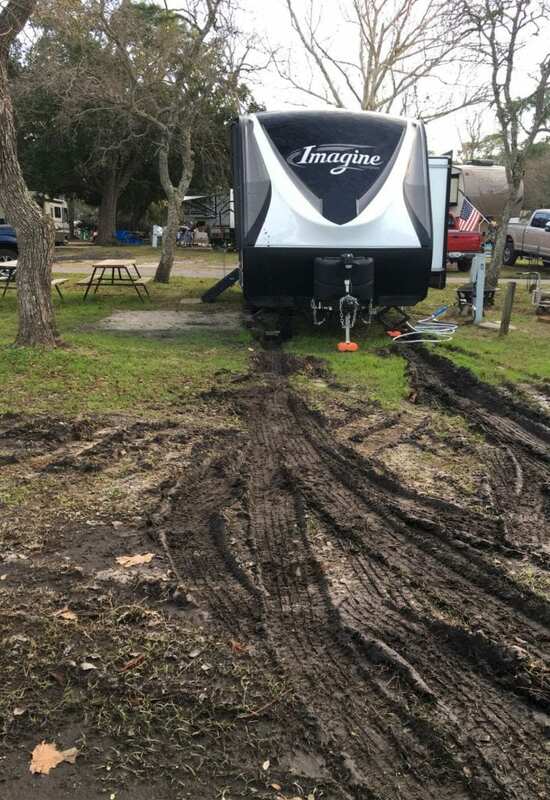 After a series of unfortunate events during the first week of the new year – surprise dog dental surgery, stolen trailer battery, Michigan football loss…alright, that one was still 2018 – I hauled the trailer down to Dauphin Island, AL. After three days of driving to get to Alabama, this wasn’t a bad view for our evening walk. I’ll spend the next two months here conducting interviews and learning everything I can about Alabama’s growing oyster aquaculture industry. The dogs and I are camping on Dauphin Island, but my focal community in Alabama is Bayou La Batre. Already known for its seafood industry, Bayou La Batre is also home to a rising number of oyster farms. I’ll hopefully have the opportunity to work with oyster farmers and commercial fishers in Bayou La Batre and all along the Alabama shore. I’m also taking advantage of the proximity to Auburn University’s Shellfish Laboratory (and one of my dissertation committee members) and will get my feet wet in Alabama by joining the Marine Invertebrate, Fisheries, Restoration and Aquaculture Lab on the water tomorrow. I’ve been living in hurricane-susceptible areas ever since I left Michigan in 2005. This year’s hurricane season, however, has been more of a presence for me than most. And we still have almost a full month to go. What made this year different? Well, first, it’s been a pretty powerful season as far as hurricanes go, building upon trends. Second, I’ve spent this year’s hurricane season living in a travel trailer – mobile, but vulnerable, and always located along the coast. Third, my research continually introduces me to more and more people whose livelihoods depend on the water, and a major hurricane can really upend those livelihoods – literally and figuratively. With each hurricane warning, people, communities, and landscapes are on my mind. First this year brought Florence to the Carolinas. I watched track updates on my phone from my nearly sea-level campground on Maryland’s eastern shore, ready to move the trailer to higher ground if needed (and grateful for the offers of driveways and homes). As the storm made its way west across the Atlantic, its certainty of making landfall at a town that was my home for 5 years only increased. As Florence hit Wilmington, I thought of friends who still lived there and the beaches, marshes, and swamps that I spent so many hours in. And I thought of the oyster farmers trying to build North Carolina’s oyster aquaculture industry – most of whom I’ve yet to meet, but through the magic of social media get to keep up with daily. Those who prepared for the storm and secured their gear and oysters still experienced damage and had to hold off on any sales until water quality was back to normal after the storm. Several weeks after Florence hit the Carolinas, I drove down to the Carolina border to see family. 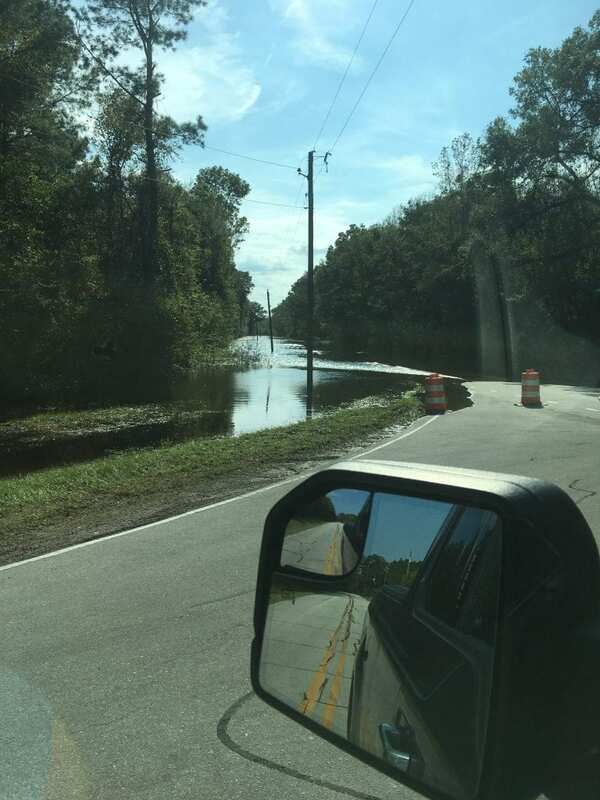 It was a long slow drive down Highway 17, passing still-flooded roads and homes with furniture, clothing, and all other types of material possession sitting out at the curb, water-logged, damaged, and waiting for pick-up. I bypassed Wilmington, as recommended by every highway advisory and friends that only recently made it back in town (but incidentally not by my GPS). Admittedly, I was dropping the dogs off in South Carolina on my way to the Florida panhandle for a non-research related celebration. Not one to miss an opportunity to talk oysters (as every single person who was around me that weekend can confirm), I worked with an oyster farm in Panacea, FL (just east of the Apalachicola National Forest). Matthew and Hollie Hodges of Wakulla Mystique Oyster Farm let me join them for a beautiful day working oysters on their lease, and shared their story as well as the story of Wakulla and Apalachicola oyster industries – which, incidentally have taken different paths even though the wild oyster harvest from these two counties (Wakulla and Franklin) is inherently linked. Matthew told me about his own path from working the water as a wild oyster harvester to an oyster farmer and the possibilities ahead for Wakulla’s aquaculture industry. Matthew and Hollie Hodges sort oysters from their lease in the waters off of Wakulla County, FL. Photo by: Adriane Michaelis. 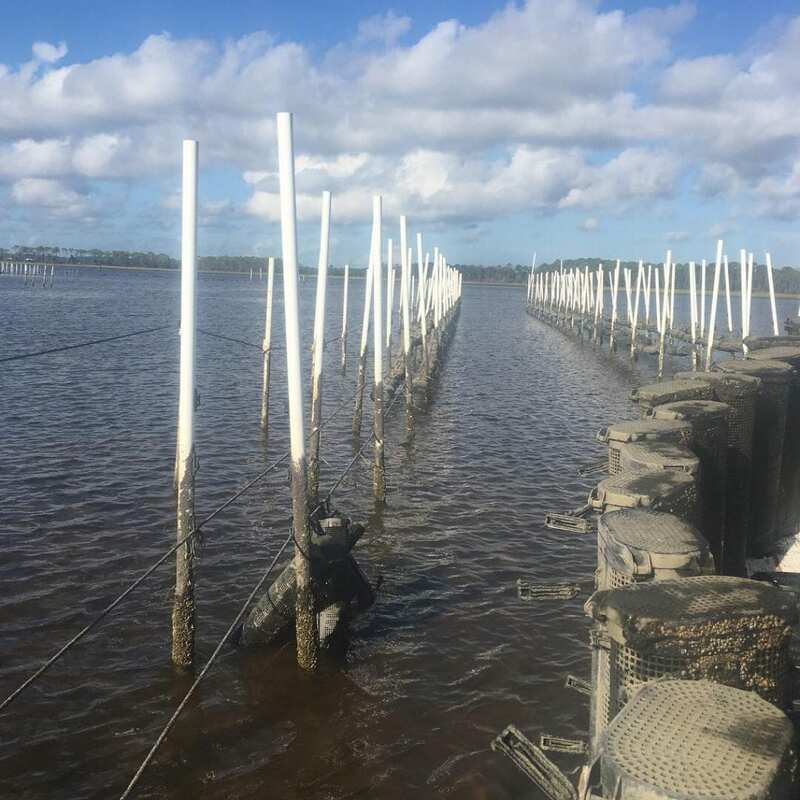 Here, Wakulla Mystique oysters are grown using a long-line system. This photo was taken just a week or two before Hurricane Michael moved through their lease. Photo by: Adriane Michaelis. Fortunately, Matt and his Wakulla Mystiques made it through Michael well enough. This wasn’t the case for everyone in the hurricane’s path, as highlighted in various news stories. 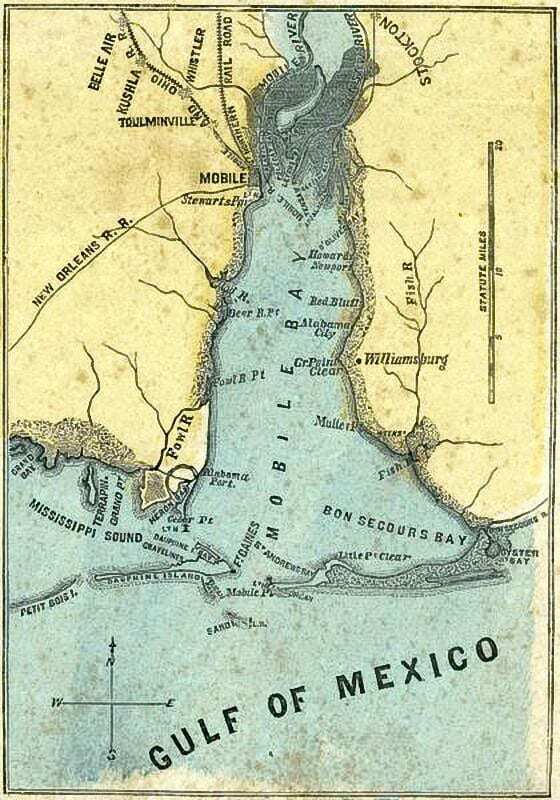 The Apalachicola oyster industry, in particular, received attention because of its tenuous future. Oyster farmers in the area worked to recover their gear and assess the damage caused by the historic Category 4 Hurricane. I experienced the tail-end of Michael from my campground in Virginia. 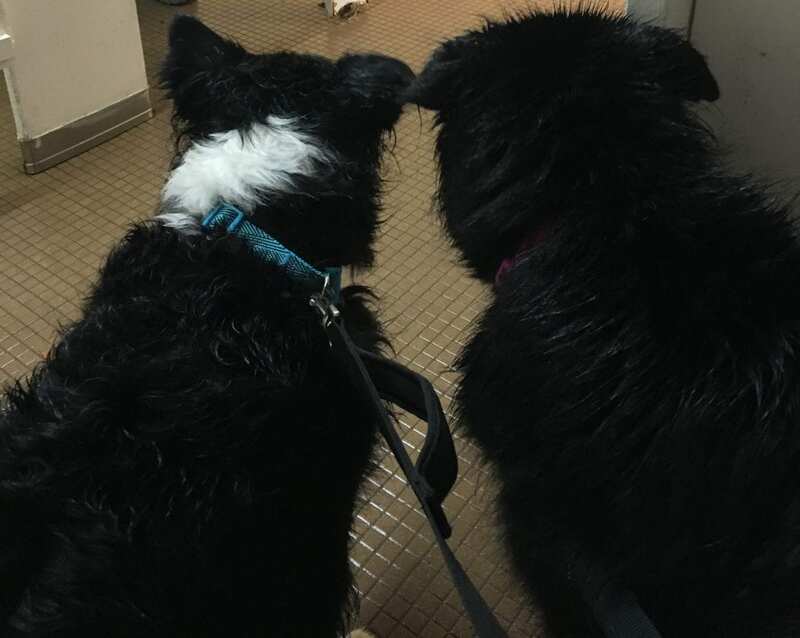 As Michael, which had slowed to a tropical storm at that point, brought rain, heavy wind, and tornadoes to the Middle Neck of Virginia, the dogs and I sheltered in a campground bathroom with fellow campers (and their dogs and cats). We made it through the storm fine – though I second-guessed how smart it was to spend the night in the trailer even after the tornado warnings ended. We lost power and water for only a few days, but other parts of the county took longer. 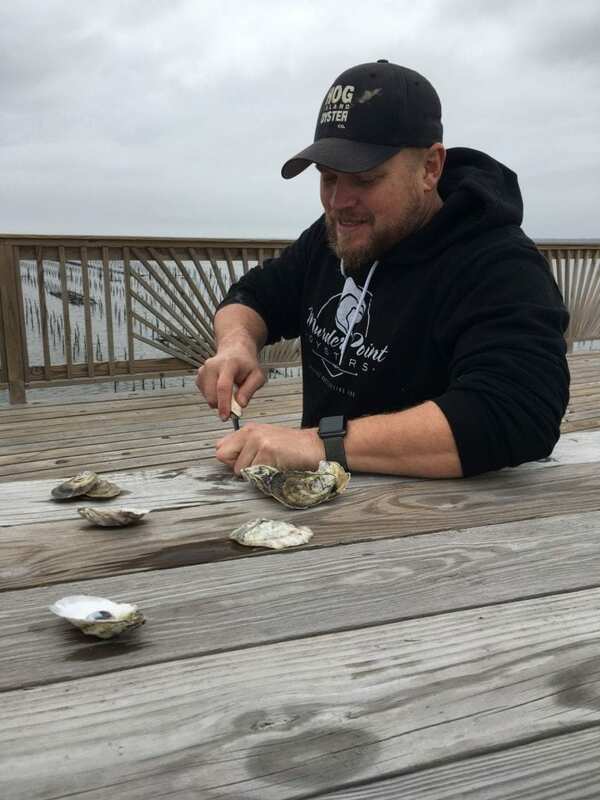 Oyster South with the Pensacola Bay Oyster Co. are selling shirts to raise funds for oyster farmers impacted by Hurricane Michael in the panhandle. Click here to order a shirt and note #PanhandleProud with your order. The Red Cross always accepts donations to assist with all hurricane relief. Click here to support Red Cross efforts. Berman, M., Freedom du Lac, J., Hedgepeth, D., and Rosenberg, E. (Oct 12, 2018). Hurricane Michael aftermath: Storm leaves death, devastation across Southeast. The Washington Post. https://www.washingtonpost.com/news/post-nation/wp/2018/10/12/hurricane-michael-updates-cleanup-and-recovery-in-the-aftermath-of-a-deadly-storm/?noredirect=on&utm_term=.6c37c1d7921f.